Welland Canal – Ontario, Canada | World Shipping, Inc. The Welland Canal is a ship canal in Ontario, Canada, connecting Lake Ontario and Lake Erie. Traversing the Niagara Peninsula from Port Weller to Port Colborne, the canal forms a key section of the St. Lawrence Seaway, enabling ships to ascend and descend the Niagara Escarpment and bypass Niagara Falls. 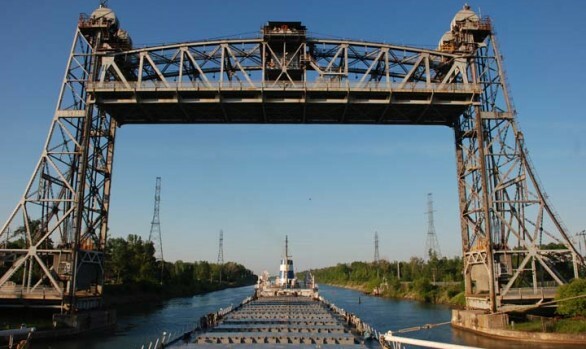 Approximately 40,000,000 tonnes of cargo are carried through the Welland Canal annually by a traffic of about 3,000 ocean and Great Lakes vessels. This canal was a major factor in the growth of the city of Toronto. The original canal and its successors allowed goods from Great Lakes ports such as Cleveland, Detroit, and Chicago, as well as heavily industrialized areas of the United States and Ontario, to be shipped to the port of Montreal or to Quebec City, where they were usually reloaded onto ocean-going vessels for international shipping.